I was capturing waveform of SPI signal using scope , signal is in 8-10Khz range, scope is 100Mhz bandwidth. What I see both high and low level of signal at same time on scope ( see above pics with red marks) , Scope running in auto mode and normal triggering mode both. But i do single trigger or stop the capture then this become OK, look to me any setting or refresh rate of scope. Did any one see this type of thing with DSO. You have a non-simple signal waveform that has an overall "repeating" time-span in excess of the timebase setting of your DSO. This means that you will "see" (apparently simultaneously) multiple instances of parts of your waveform on your screen. Due to persistance of the eye it looks like one waveform but I can assure you that you are seeing multiple parts of the "full" waveform sitting on top of each other. The tektronix scopes have acquire modes, this lets the signal persist so you can see multiple triggers, average, or a variety of other visualization options depending on your model of scope. If you only want to see one triggered waveform capture, press the acquire button and set it to sample (which may be different on your scope, since you haven't provided any model numbers). 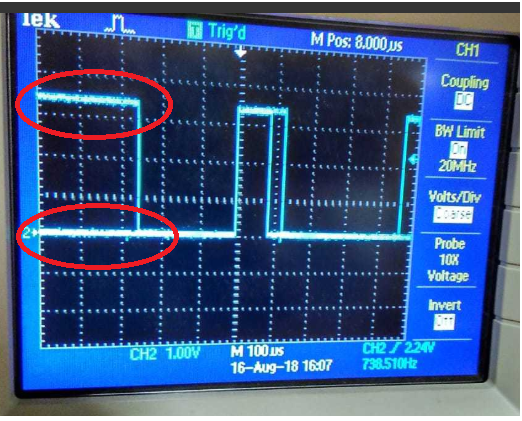 Error caused by Scope or Function Generator? Why does my waveform start ahead of the trigger? How can I reduce an oscilloscope's bandwidth to that of an Arduino's ADC? 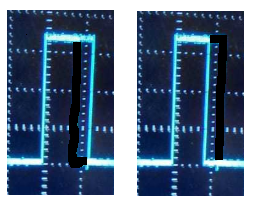 Oscilloscope waveform shows overlapping levels, second harmonic?